Ex-president Asif Ali Zardari and his sister Faryal Talpur on Tuesday appeared before banking court in Karachi in money laundering case. According to details, former Pakistan Stock Exchange Chairman Hussain Lawai, Omni Group Chief Anwar Majeed and his son Nimr Majeed were also present in the court. However, the hearing has been adjourned till December 10 without any proceeding. 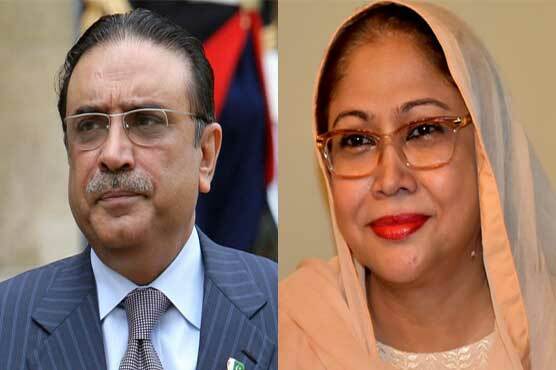 Earlier, a session court in Karachi had declared former president Asif Ali Zardari and his sister Faryal Talpur absconders in the case while main accused Omni Group Chairman Anwar Majeed along with his son Abdul Ghani were arrested from Supreme Court (SC).